I had good meetings today with city and county managers in western North Carolina. The managers out here meet regularly because Vickey Wade with Western Carolina University does a great job of organizing them. She also works with Fleming to organize much of our training in western North Carolina. I attended their lunch meeting at the North Carolina Arboretum outside of Asheville. There were approximately 40 managers at the lunch. The agenda listed me as giving an “address” and talking for 30 minutes. I started my remarks by promising that I would not give an address or talk for nearly that long. A noticeable sense of relief spread throughout the room. I thanked them for paying their membership dues and expressed our commitment to working in partnership with them. I pointed out that we have increased services for them notwithstanding a 15% budget cut over the last two years. Webinars, blogs, and online modules are a few examples. The managers’ budget forum in Raleigh a few weeks ago was an example of our responsiveness to a specific request for assistance. There was no charge to the managers who attended. We could not be as responsive in the face of deep budget cuts without strong support through the membership dues. It is much more than the money, however. It also is a determination by our faculty and staff to continue serving North Carolina officials at the highest possible level, especially at a time when they need our assistance more than ever. That comes as no surprise to me or to the managers, but it still is impressive. Thank you. The spring meeting of the western managers includes a budget roundtable with each manager providing an update about his or her budget for next year. I was struck by the incredible range of economic conditions that they are facing. Some communities will have a significant reduction in property tax revenues because a recent revaluation yielded much lower property values, for example, but others are coming out of a revaluation year with almost no change. Some local governments are experiencing large increases in health care costs for their employees while others are seeing only modest increases. I was surprised that a handful will be giving modest cost-of-living increases, and a few will even be giving merit raises. I take that as a positive sign. At the same time, however, many have reduced departmental operating budgets and have eliminated a number of staff positions (some of them filled). One manager’s comment resonated with the group: “We will be okay as long as the state doesn’t throw us under the bus.” Everyone is waiting to see how the state budget affects local governments, and they worry that it may be a very long wait. One of the last managers to speak described how she plans to invest more in the professional development of their employees. She said that training is more important than ever because “we need the creative thinking of our employees.” Amen. I was proud that it was Marcy Onieal, the Manager for the Town of Black Mountain and one of our MPA alums. 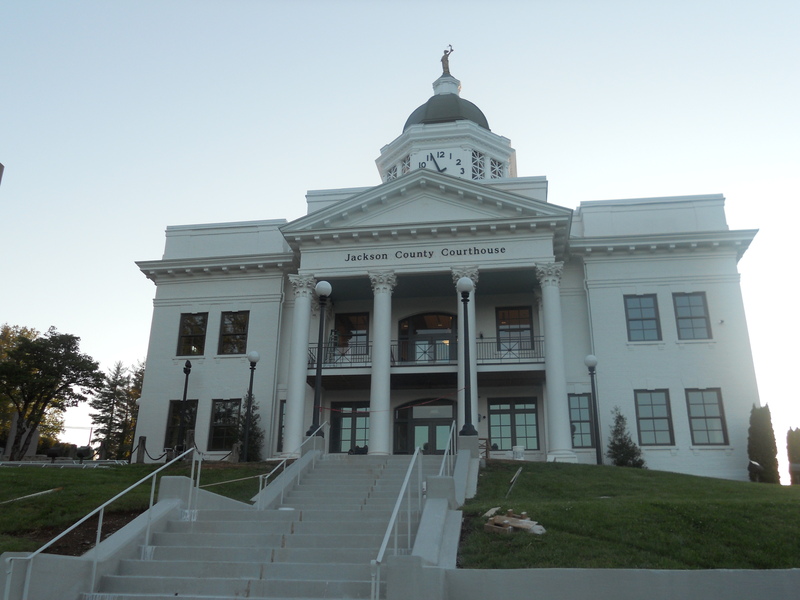 Courthouse Update: Because I know you are monitoring this closely, I was told at lunch today that the Madison County Courthouse was patterned after the Henderson County Courthouse. It was not the original design, but it was the second and Jackson was the third. You know you are deep in the weeds when people start trash talking about courthouses. I was in Sylva this evening for dinner, and so I’m including a picture of the Jackson County Courthouse. Tomorrow morning I’m off to Graham County (Robbinsville) and Cherokee County (Murphy).